I've made a couple of little things involving thread and fabric, though there's no difficult sewing involved! The first is these little notebooks made from Project Life journaling cards. They end up 4 x 3" a perfect size to fit in my organiser / planner and handy to have just to scribble down ideas. I will be using them to keep my sewing and quilting project ideas in! They were very simple, take one Project Life card (or piece of card that's 6 x 4") and fold in half. I then folded up some regular A4 printer paper and used a ruler to rip it into pieces that measure approx 3.75 x 5.75", I like those torn edges but you could cut the paper if you prefer. I used 10 pieces of paper in each notebook. Fold the paper in half and place inside the card. Using a strong needle, pierce through the card and paper - once in the middle, then make two holes above and below. Take some thread (I used perle), thread your needle making a small knot at one end and stitch through the centre. Stitch through the next hole and then through the one above, you are making a figure of eight essentially... come back through the holes until you are at the centre and then do the same thing on the other side. Once you are back though the centre, make a knot and snip off any extra thread. I decided to clip the corners because they were poking out a bit, you could use a punch or fingernail clippers to make the corners rounded if you prefer. I decided to embellish them with some cute stickers! I popped out the little wire doodad, stretched the fabric over the front, pushing it into the grippers and smoothing the edges then pushed the back on. It was such a simple make and took about two minutes to do. Blob of super glue to stick one of the magnets on the back and done! I need to be getting back to some embroidery and cross stitching so I can use this baby. cute ideas :-) I desperately need a needleminder - I am going to swallow my needle one day if I keep up my usual practice! Love your personalised needleminder! I've been very curious about them lately. Where do you usally place yours when your sewing? Do you have something metallic at hand? So pretty! The notebooks are super nice! Cute little notebooks - they look quite handy! 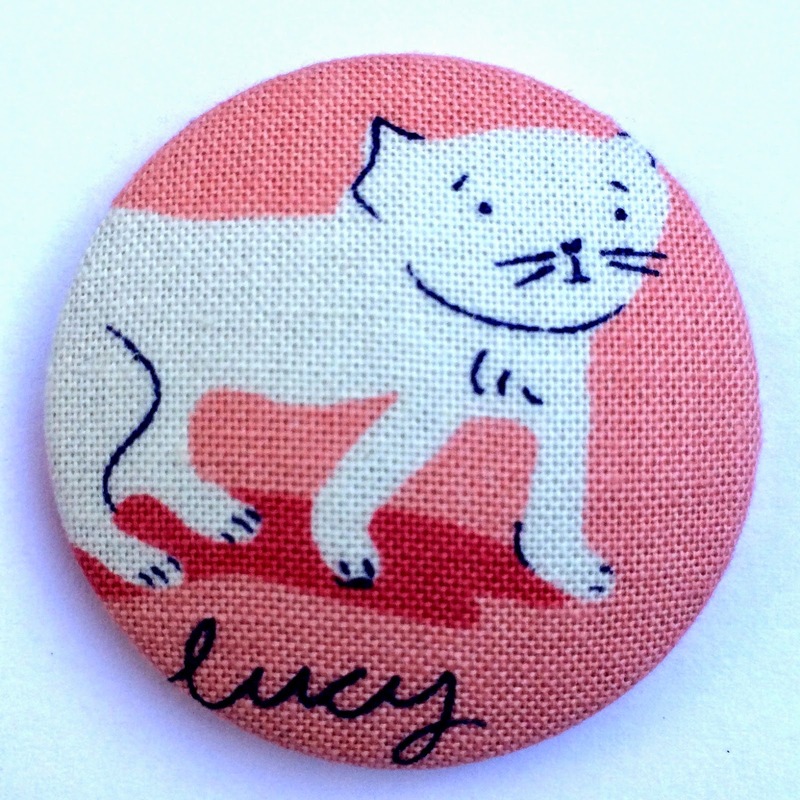 Love your little kitty needle minder. How sweet! Looks like you have a nice haul of zippers added to your stash. Should keep you busy for a while! Oh my goodness! Those are the cutest little notebooks I've ever seen! You are the stationary queen. These notebooks are so cute! And I love the needle minder idea. Thank you for sharing. I love the little notebooks, the only problem is when I make or cover a notebook, I don't want to write in it! awesome needleminder, where did you get the magnets? What a cute little notebooks! What fun ideas, Lucy! Thanks bunches!! I love the needle minder!! P.S. What are Project Life cards?! !